Plot synopsis: An actor angry at having been fired from a play takes his revenge upon the director responsible by shooting him, and then tries to escape the electric chair by feigning insanity. Review: This story was adapted three times for Suspense - there are minor differences between each version, but overall they are very similar. My preference is for the first adaptation, starring Milton Berle - though some might favour the 1958 one, since it stars Vincent Price, who had such a rich, distinctive voice - because Berle conveys best the main character's efforts at pretending to be insane without going completely over-the-top with his performance. Regardless of which version is listened to, this is a very good story. Rather than being a standard 'whodunit', it is about whether or not it is possible to get away with murder, even after having been caught. In exploring this idea, the episode is clever and ingenious, with a series of twists that keeps the listener involved. The story is, admittedly, fairly implausible - it's extremely unlikely that the main character's ploy would work, even to the extent that it does, in the real world - but even so, a strong episode. Plot synopsis: A woman on the run after embezzling money from her employer encounters a man who appears to be a bank robber and a murderer. 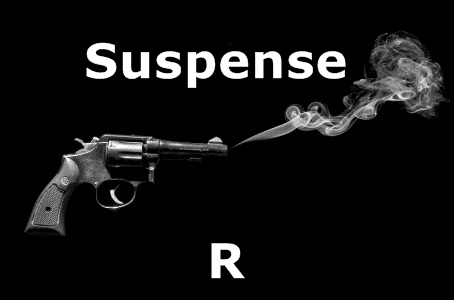 Review: If you listen to this episode, prepare yourself for one of the most contrived and unbelievable twists of any Suspense crime story. To begin with, the story plays as a solid and atmospheric noir thriller; particularly interesting is that the initial set-up, involving a female employee going on the run with money stolen from her boss, is reminiscent of the start of Psycho. Probably the strongest aspects of the episode are the performances of real-life couple Lucille Ball and Desi Arnaz in the main roles. Ball especially, though best remembered today as a comedian, demonstrates that she was also capable of being a fine dramatic actress. The plot and script are also good, at least for the first two-thirds - but then comes the absurd twist that undermines any credibility the story had. I won't give away what it is, but it really is very silly. Also disappointing is the final scene, which acts as an epilogue to the main tale, offering as it does a very dated depiction of married life, and undercutting the tough, independent persona that had previously been established for Ball's character. Plot synopsis: After holding up a grocery store, and killing the owner, a robber has to deal with a woman who recognizes him from high school. Review: There's no mystery in this episode about the identity of the killer and only a small amount of suspense - over whether or not the protagonist will go through with his plan to kill the woman who can identify him to the police - but it still manages to present a powerful and compelling tale. Essentially a character study, the story shows how life can turn out very differently to what people expect, with its one-time popular high school sports star reduced to the status of a petty criminal. It also demonstrates how not just deliberate, but even unintentional, slights can hurt very deeply, as the woman who has had a crush on the main character ever since high school gradually realizes that he does not even remember her. As such, it eventually becomes quite a poignant tale, with strong performances by the two leads and a solid, well-crafted script. Plot synopsis: When explorers land on an alien world and discover the remains of a dead civilization they seek to uncover what caused its extinction. Review: The fundamental problem with this episode is that any science-fiction fan will probably predict, very early on, how it ends; in fact, even if you're not a science-fiction aficionado, you'll still be able to guess how it does. Predictability in a story needn't always be a fatal flaw, if there are sufficient other positives to compensate. Yet in this case, there aren't. Neither the script nor the characterization is particularly strong; and there is nothing noteworthy about the production or performances, either. Instead, for most of the episode's length, it is a very ordinary account of the exploration of a dead alien world that is neither very evocative nor very interesting. When it finally comes, the twist reveal is fine (whether or not listeners have realized what it is going to be), but far from original. For example, an earlier OTR episode that employs a very similar ending is The Mysterious Traveler's 'The Planet Zevius' (1949 and 1951) and so have many other science-fiction stories, in print and on radio and television. Plot synopsis: A police detective's investigation of a hit-and-run murder leads him to confront a gang of teenage street racers, the 'Jolly High Riders'. Plot synopsis: A bus carrying three passengers on a return trip from a mental asylum is stopped by guards to inform them that a homicidal patient has escaped, leading its occupants to begin to suspect that one among them may be the killer. Review: It's a classic set-up: a group of characters trapped in a confined space, one of whom is a murderer, yet nobody else knows which. No prizes, then, for originality, but this is still a fun episode, leaving the audience guessing until the end as suspicion falls in turn upon each of the characters. In truth, some may well work out the killer's identity a little earlier, but there are enough twists, and sufficient misdirection, to make it not entirely obvious. The snow-swept setting and some good work from the cast also contribute to making this an exciting, above-average story.